Disclaimer: Darlin’ Deals was compensated to promote this contest. However, I was not persuaded to write a positive review. Darlin’ Deals is proud to promote a Kid’s Academy App Contest! Kids Academy is also hosting an awesome giveaway! Just download their FREE app and write a review in the iTunes App Store. At the end of August, Kids Academy will choose 2 lucky winners who will each receive a $100 Amazon gift card! This giveaway is in no way affiliated or sponsored by Facebook, Twitter, or Pinterest. Darlin’ Deals is not responsible for product shipment. On Friday, August 1st, you can get Tide Laundry Detergent as low as $1.50 at Safeway stores (Vons & Pavilions in Southern California)! Thanks, Who Spends Money & Hip2Save! 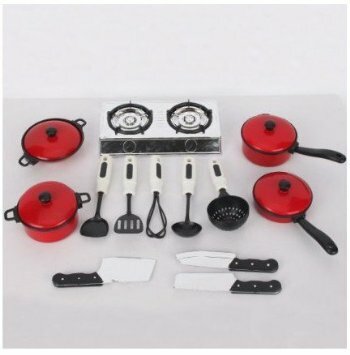 13 piece Children’s Play Cookware Set just $6 + FREE Shipping! Amazon has this fun 13 piece Children’s Play Kitchen Cookware Set for just $6.68 + FREE Shipping! TODAY ONLY you can get The Hunger Games for just $1.99 (normally $12.99). NOTE: You can read Kindle edition of books on your computer, any tablet, or mobile device by using the FREE Kindle Reading Apps here. Darlin’ Deals Review & Giveaway ~ Fairhaven Health Nursing products! Disclaimer: I received complimentary Fairhaven Health nursing products to review. I was not persuaded to write a positive review. All thoughts and opinions are my own. If you have ever been a breastfeeding mother you know just how precious your milk is. Every drop of that liquid gold should carefully stored for bottle feedings when its necessary for you to be away from your child. Sometimes you are so busy caring for and feeding your baby that it becomes difficult to find time to pump milk for storage. Furthermore, its crucial to store breastmilk in a way that will keep it fresh for future use and organized so you ensure your baby gets milk that hasn’t expired. Fairhaven Health keeps both of these issues in mind by carrying a line of products called Milkies. I was sent 2 Milkies products to use in conjuction with nursing my daughter – the Freeze breastmilk storage system and the Milk-Saver. This was my first experience with these products and I was eager to see how they worked. The Freeze system is a plastic upright container intended to be placed in a freezer and used to organized expressed breastmilk placed in storage bags. There is a metal tray at the top to place each fresh bag on so that it freezes flat, then you slide the bag in through the top opening and it falls down to the bottom of the Freeze storage unit conveniently keeping the bags in order so that you pull out the bottom bag first which has been in the storage system the longest. This was an amazing product, when I breastfed my first child I stored my bags of breastmilk in a food storage container in the freezer and it was such a chore sorting through all of them to find the correct bag to feed my baby based on the dates written on them. The other product I received, the Milk-Saver, was a unique product that I’d never seen or heard of in all my years of parenting. Its a soft silicone type cup that you place inside your bra while you are nursing your baby. It goes on the breast that is not being used to feed your child and it collects any milk that drips while you nurse on the opposite side. I was skeptical about this product because I wasn’t sure just how useful it would be – I thought, how much milk naturally could leak without using a pump? Well the answer is A LOT! I used this for a few days while feeding my daughter and I was surprised to easily collect over 2 ounces each day from all my feedings combined! That’s a lot of milk that would have otherwise been wasted. I highly recommend these products if you are nursing or know anybody who is, they are both high quality products that can make your experience with breastfeeding much easier! Fairhaven Health has generously offered to give 1 Lucky Darlin’ Deals fan these Milkies brand products! Brother brand Sewing Machine 71% OFF! Currently this highly rated Brother brand Feature-Rich Sewing Machine is 71% OFF!! Features 60 built-in sewing stitches, a detachable, oversized table for larger projects, a hard carry case, easy-to-view backlit LCD display, automatic needle threader, easy-to-follow threading diagrams, and adjustable sewing speed control. Darlin’ Deals Review & Giveaway ~ Cassema Photography Exclusive Photo Print! Disclaimer: I was offered a 3-session discount photo shoot in exchange for honest reviews. I was not persuaded to write a positive review. All thoughts and opinions are my own. When my daughter was 6 days old Cassie from Cassema Photography came to my home to photograph my darling little Avianna. Let me take a step back and mention how flexible Cassie was with the scheduling of the appointment. As you know babies decide to arrive whenever they want and unless you have a scheduled C-section or induction date you are waiting on the edge of your seat for your little one to decide to make their arrival. Upon discussing the newborn photos with Cassie she tentatively scheduled the photo shoot for 1 week after my due date with the complete flexibility of re-scheduling for a sooner or later date depending on my daughter’s actual birth date. Since I carried my son to full-term we assumed my daughter would make a 40 week arrival as well – and she did! When Cassie arrived at my house she brought an assistant to help with set up of props and backgrounds and most importantly to safely and carefully hold my newborn daughter in the poses. One of the most important things when photographing a newborn is safety, they have no control of their neck and they are so wiggly. Cassie reassured me that my daughter would be held at all times and my husband and I were encouraged to be near Avianna during each photo as well. All of the details of set-up were handled by Cassie and her assistant and I was able to comfortably nurse or rock my daughter between wardrobe and background changes. Speaking of props Cassie has talents that go beyond her photography skills, she also knits! Cassie handmade the Mermaid costume (shown in the photo above) for my daughter’s newborn photos. Here is an example of how the assistant very delicately held my daughter’s head in position for a photo and Cassie photoshopped out the hand. Even though the photos may display a peacefully sleeping baby there were moments in between the camera’s shutter that were filled with all the joyful things that a baby does like crying, fussing, and even peeing on the props (but as I mentioned Cassie was prepared for that to happen and had a disposable pad set down in case of accidents) but Cassie never seemed stressed out by the delays or crying which was a relief to me. In addition to being wonderful with my daughter Cassie was also very understanding of my needs as a mother recovering from child birth, the family photos were positioned with a pillow under me and done quickly so I didn’t have to sit in a posed position very long. The entire experience was amazing and I was so pleased with the relaxing environment of having my daughter’s first photos done at home. I highly recommend Cassema Photography for your newborn’s first photos, or for any occasion or event that you need photographed. Cassema Photography is offering 1 lucky Darlin’ Deals fan a one-of-a-kind autographed Cassema Photography exclusive 9×12 mounted print of the flower (shown below) mounted and ready for hanging. *The Cassema Photography watermark will be removed from the photo before it is sent to the winner. BONUS: If you happen to be local to the Santa Clarita Valley or North San Diego area Cassema Photography is offering 15% off their regular priced photo services to anybody that mentions Darlin’ Deals when booking. This giveaway is in no way affiliated or sponsored by Facebook, Twitter, or Pinterest. Must be at least 18 years old to enter and have a US mailing address. Winner will have 24 hours to claim prize once announced. Darlin’ Deals is not responsible for prize shipment. No monetary compensation was provided to Darlin’ Deals for this giveaway, only complimentary products were sent for review purposes. Giveaway is opened to US Residents. Darlin’ Deals is not responsible for product shipment. Disney’s Frozen Clothing as low as $7 + FREE Shipping! Amazon has some great prices on Disney’s Frozen clothing! + tons of other Frozen clothing available here. *Remember Amazon pricing can change at anytime, order now while the prices are low!